Wow! What a week we've had over here! To start, the AQS Quilt Show was in Chattanooga. This means I spent two full days at the show looking at beautiful quilts, volunteering as a show hostess, shopping and even taking a class. Devin and the kids managed to keep chores done while I was gone, and I was happy to have a few days of fun. 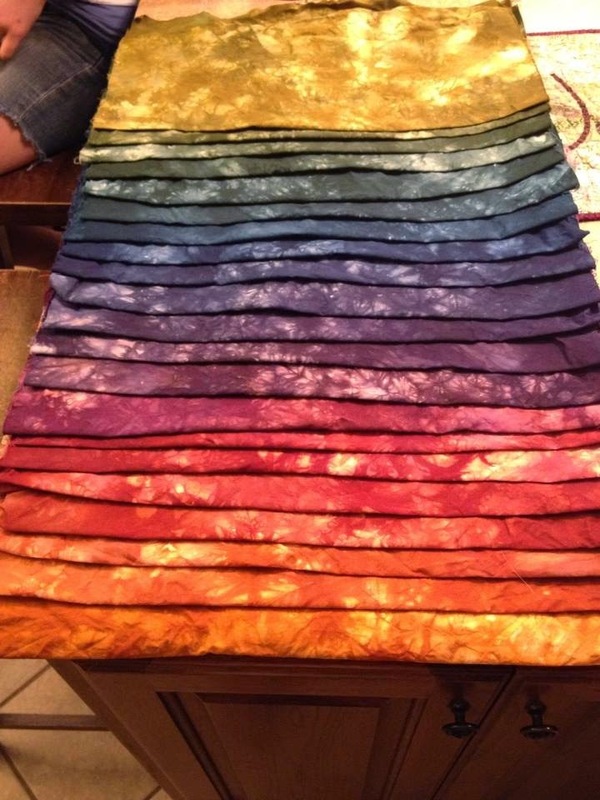 The class I took was a fabric dyeing class taught by Cindy Lohbeck of Hands on Hand Dyes. This class was so much fun and I left with 6 yards of my own hand dyed fabric, ready for a quilt. The fabrics were dyed using only 3 packs of dye, but we ended up with 24 different colors. I can't wait until she comes back next year, and I will be taking one of her other classes! Saturday we had fabulous fall like weather. The breeze was so nice and the humidity was low. This, of course, means perfect back yard fire pit weather. We had an impromptu hotdog and s'more roast for dinner. Everyone enjoyed the weather and the fire pit food. 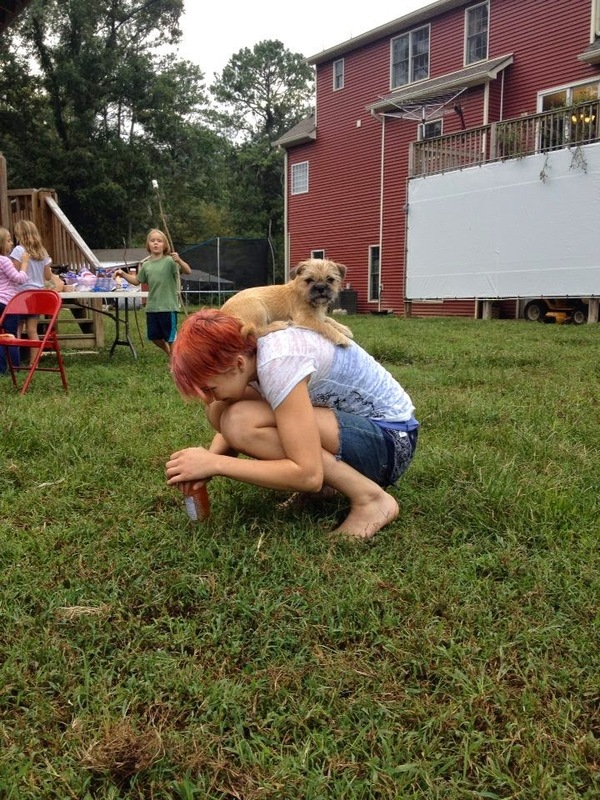 The puppy enjoyed himself and made himself a comfy spot on Indiana's back. Silly pup. This weekend we also decided to move the turkeys out of a chicken tractor and into a fenced area. This chicken tractor is meant for the pastured chickens and I really needed to use it for that purpose. The turkeys also needed more room to move around. Instead of buying another portable poultry fence (I am feeling cheap), we decided to let the hens free range and use their fence for the turkeys. I will still need to build a better rain shelter and move the fence every few days, but this seems to be working well. The birds like the space and grass for sure, and you will not notice any complaints from the free ranging hens. My drive will be sprinkled with poo for the next couple of months, but that is not the worst thing. The hay is also being cut, so of course it is overcast and threatening rain today. We are hoping to get it all cut, baled and put up before it starts raining...or maybe the weather is bluffing. It might not rain at all, but we could sure use some sun to dry the cut hay. Either way, it looks like we will have around 700 bales to get us through winter. Once we are done putting it all up I can let the cows back out to free range as well. Today we get back to the books and school work. 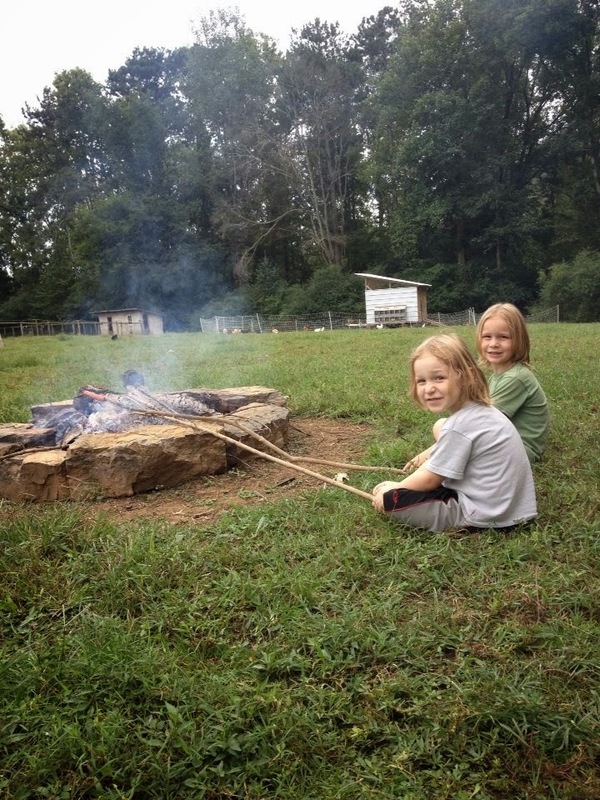 Fall is around the corner, which means more back yard fires in the near future! Hope your week is a productive one!